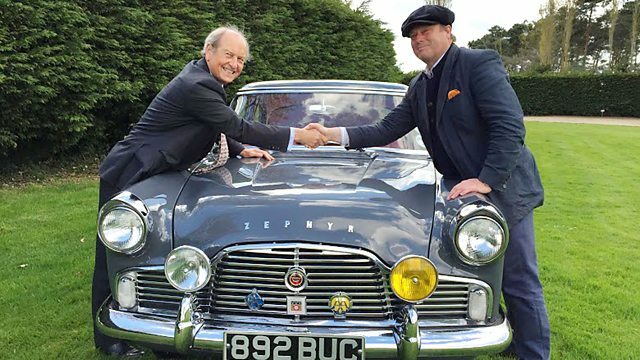 Charlie Ross and James Braxton begin in Boston and make their way to their first auction in the Norfolk town of Fakenham. James Braxton and Charlie Ross. Sounds all right to me, Charlie. before seatbelts were mandatory, and spirits are high on day one. I'm in the hands of an expert driver. Charlie smashed a road trip record. and sold it for an astonishing £2,700. James took his defeat on the chin. I'm leaving. I think my road trip is over. Don't tell me you're into yoga?! Both mentally prepared and physically prepared. Our experts have £200 to spend. before heading south and finishing in the Surrey town of Cobham. and heads to auction in the rural Norfolk town of Fakenham. Charlie's first shop is an old railway station office. All my shopping will be over in a twinkling of an eyelash. Crikey, he's in a hurry! -Jack, I'm running to meet you. It's always such a pleasure to be here. Can I have a look round? -Yeah, have a look round. but it's outside that looks rather interesting. Good Lord, you've got a camel! Was that here last time I came? -Can I go and sit on him? -Yeah, you go sit on him. -I've never bought a camel. -I'm going to fall over this damn thing. -Mind how you go, Charlie. -The stepladder is not very strong. I feel like Lawrence of Arabia already. You look a bit like Peter O'Toole. Haven't got any white robes, have you, Jack? This is not a camel for a hernia problem, is it? -How much is your camel, Jack? -He can be 275 to you. -It's for nothing, isn't it? A steal, but, sadly, too rich for your blood, Charlie. if there's anything in your price range here. -It's a bit more modern, that, isn't it? -Yeah, it's '50s, isn't it? Got a plastic head. He's quite fun, though. -Can that be 30 quid? Jack, I thought I'd ask. There's never any harm in asking, Jack. £60, I'll have a deal with you. -He's coming down. Jack's coming my way. -Jack's coming to meet me. -that's the most awful cruet I've ever seen in my life. -It's got to be '50s. Now we're going, now we're going. We're really motoring now. Could spend all my £200 here today and then go to the seaside. Bingo would be so jealous. under consideration, he is making progress. -..what about this globe here? That's quite nice. -Is that a 30-quid globe? -Lovely globe. It's in super condition. Come round, Jack. Let's get to the nitty-gritty of this. I quite like your globe. I love your toy. The cruet I think is ghastly, but is saleable at a price. -Not going to take 100 quid for those three, are you? Give me another 20 and you've got a deal. -And not a penny less. because I think you've been very fair to me. Charlie's off on a flyer. and the chromium-plated cruet in the form of an aeroplane for £20. -Lovely to see you, Jack. Meanwhile, James is heading to the centre of Boston. and if the paint looks fresh, well, that's because it only just opened. -Welcome to the Magpie's Nest. -Des, very nice to meet you. -We've only been open for one week now. So there's no point in me saying fresh goods here. They're all fresh. -Lead on. Lead on, Des. This way into one of the first rooms. but nothing's got James hooked just yet. We're not finding you a sale yet? No, don't worry. I just like to drink it all in. And he won't miss a thing. Look at this tall fellow. He is handsome. I always like something that's a little tall. What is this for? -I think that's for gladioli. Dame Edna Everage's great, great thing. I love the way she used to throw it at the end of the thing. She used to throw these things out. Gladioli is like being hit by a bit of bamboo, isn't it? I think it's made for a '60s, '70s market, isn't it? -So very light, isn't it? -What have you got on it? What about 15? What about 10, mate? -Very kind. Thank you, Des. has been snapped up by James for £12. Charlie has travelled to the Lincolnshire town of Spalding. With three items already under his belt, he's on a roll. -Ah, this must be the boss? -Hello, Charlie. Nice to see you. John, lovely to be here, John. Now, may I have a quick look round? You have a look round with pleasure. oil painting of Chas and Dave, so what other gems are there in here? I caught a glimpse of an extremely exciting item. Well, I tell you what, what do fish have on the outside? -Can we go and have a look at them? -Yes, let's have a look. -Here they are. Look at that. -and there's the fine tuning for your pounds. On the scale of things, these look very nice. I'll be perfectly honest with you. -I think they'll probably sell for 35 quid at auction. Charlie's going to think about that one. that might just suit his personality. Ooh, you've got a racing car, a Ferrari, no less. -I think it is a Ferrari. I can tell you it's a Ferrari. Look at that. -Wonderful. I've sold a real one of these. Do you know how much it made? 16 million. I think this is probably a little less. -What, a Ferrari for a tenner? -A Ferrari for a tenner. "A Ferrari for a tenner. You're in Spalding!" ..by your Ferrari and your Victorian scales. We might be able to do a little package, do you think? but can Charlie strike a deal for the two? Now, you don't want to take £20 for your scales, do you? -I'll take £30 for the scales. The scales I want to buy because I think I might make a profit. but it's me, isn't it? -I'll give you 30 quid for your scales, John. I'm sorry I haggled so hard. That was a bit naughty of me, really. No, it wasn't. It was most enjoyable. But you stuck your ground and I'm happy to give you £30. Well, that's very kind of you. You ought to have the Ferrari. I should have a Ferrari, shouldn't I? It's silly not to buy a Ferrari. I shall be able to go out this evening now. Yeah, I'm going to have your bloomin' Ferrari. -I can go out tomorrow night as well. You can go out for the rest of the week, sir. -John, it's been a pleasure. for £10, bringing his total spend to £160. Bingo, who would have thought it? I've come to Spalding and what have I found? While Charlie's been spending, James is heading to King's Lynn. this historic Norfolk town was literally struck with tragedy. bombed from the air by the Germans. To make matters worse, King's Lynn wasn't even the intended target. where curator Dana Woolbright can tell him more. -Would you like to follow me? floating over the Norfolk skies. leave alone what was about to come. to be bombed by a Zeppelin. two Zeppelins flew over from Germany, both carrying bombs. it dropped a total of eight bombs. Some of them didn't explode, others did. and there was two casualties, unfortunately, on that night. which came down in a very small village outside of King's Lynn. -So is this just the tip of it? -It's just the tip of it. -And that's a real weight, isn't it? the community to become more involved with the war effort. table and local firm Savage's turned their business towards the fight. Frederick Savage was a fantastic engineer and entrepreneur. before he then branched off into fairground rides. one of the Savage's carousels. which avenue did he go down for the war effort? which they made in their factory here in King's Lynn. was easily transferable into working with these planes. and the King's Lynn engineering expertise didn't stop there. revolutionised how we bombed the enemy. used during the First World War. wouldn't explode until they'd been dropped out of the aeroplane. That's a very wise idea. And this great wheel thing going on in the front? -so this little propeller would have fitted on the front there. and once it had spun enough times, you get your explosion. to help with the mighty war effort. for antiques, with Charlie taking on chauffeuring duties. -Is everything all right in the back, sir? splashing £160 on five lots. a set of Victorian baker's scales, and a model car. That leaves him with just £40 to spend today. spending only £12 on a gladioli vase. His pockets are pretty full, with £188 left to spend. and heading to James's first shop. -Will that do for you, sir? I'll be around, sir, don't worry. -Ah, thank you. Thank you. -Are you going shopping this morning, sir? -Just freshen you up a little, sir. he'd best not dilly-dally today. -Hello, Maggie. Nice to see you. -Now, how long have you had this lovely place for? -Two-and-a-half years? Good. Going strong. OK, well, I'll just have a good old rootle around. Chop chop. You're lagging behind here. Crikey, he's an acquired taste! Maggie, can I look in this cabinet down here? "The Beaver Talbot tie press." put in his wardrobe with the tie in? -rather like putting trousers in a trouser-press. Or maybe at rest, when he was reading his newspaper. there we are, doing two jobs at once. A man should look his best at all times. a definite contender, are there any other items on his radar? It's a stand, it's a tazza. and I think it's probably Windsor Castle. wholly appropriate it should have a terminal here, the Penny Black. This was the mighty stamp. introduced in the early part of the 1840s. This was an invention that introduced a new item. -It's like the internet revolution, isn't it? be able to do on the tazza and the paper knife. We could do...maybe 40 would probably be the best, I think. So that's sort of looking at about £20 each, isn't it? What about if I bought the strange beaver fellow, what could that be? -That could be four, could it? How about the whole lot for 40? Thank you very much indeed, Maggie. So that's a deal done for £40 for all three items. and the tie press thrown in for £4. -£40. Very kind of you. Is that you done in here now, James? -Maggie, I did notice one more thing. Can I show you? It's sort of winking at me. My eye suddenly alighted on this rather magnificent pheasant. Could it be bought for 45? armed with James's £45 offer. He says yes, the man from Del Monte says yes! -45, let's not fiddle around. and I am now offski. to £97, with one more shop to go. King's Lynn is steeped in maritime tradition. who made their mark on the world stage. and were both instrumental in some crucial geographic discoveries. from the King's Lynn Preservation Trust to find out more. Doreen, what a splendid sea breeze there is today. but I've never really realised its historical importance. it was one of the four most important ports in England. like the old custom house were right at the heart of the business. to our first King's Lynn maritime hero, George Vancouver. Born in the town in 1757, he joined the Navy at just 13.
a race to discover a faster trade route between Europe and Asia. Vancouver was sent to explore. the west coast of America. They made this massive journey from California right up to Alaska. so good that they were still used until relatively recent times. sorts of other discoveries, and even had a Canadian city named after him. When he got back here, he didn't make old bones, did he? -You're right about the old bones. He was only 39. He died of illness, but this seems to be quite common with sailors. I think it was just a very tough life at sea. That didn't stop another of King's Lynn's finest taking up the mantle. and was to become another King's Lynn naval legend. So this is a bank house. It's really rather splendid. And this was where Samuel Gurney Cresswell was born. that perhaps a naval life would be better for young Samuel. fellow King's Lynn sailor, Vancouver. -to find the Northwest Passage. actually turned back because they thought it was too dangerous. but, of course, they got stuck in the ice. was trapped in the ice for over two years. The crew, faced with starvation, were eventually rescued. a group overland for 300 miles to meet a rescue ship. All the people of King's Lynn turned out and gave him a hero's welcome. -He'd never have got that if he'd been a banker, would he? And so he was home and he was safe. its two naval heroes, it holds a special place in maritime history. James's final shop is in the seaside town of Hunstanton. James still has some shopping to do. -Hello. Nice to meet you, Patrick. James still has just over £100 to play with. and this funny-looking little old chap. -Well, he's a humorous old fellow, isn't he? He's a planter, is he? Very smart. A smart gnome's hat, hasn't he? He's rather funny. What sort of price is he, Patrick? -You could make an offer. Charlie... my competitor's reaction to it. Patrick, would a tenner buy that? -You had me worried there for a moment. I thought you'd held your breath and you were going to faint on me. -I'm sure he'll go to a good home, definitely. -I think he's rather fun. -Antiques should have a little humour. Will there be a profit in humour, though? That remains to be seen. Let's go to your till. the gnome is off to auction, and James's shopping is complete. Charlie's final shop is in the Norfolk village of Snettisham. but with only £40 left, Charlie will have to be resourceful. No better fellow for resource. -A-ha, are you Sarah, by any chance? -..and I'll scream for you if I see the bid of my dreams? Ooh, look at this. Columbia grafonola number 202 portable. What amazing condition! I don't think anybody's ever used it. Price, £85. Problem. I don't have £85. Not even half that, in fact. -This is fab. Does it play? I think I'm falling in love. Hang on. Ah, this is romance! Dim the lights! -I could give you a few lessons, if you like? It's portable, so you could take it on a picnic. -..because I went shopping yesterday. -Could we run to 50? I haven't got 50. I have not got £50. -I can tell you, I've got 40 quid. -Do you have rubber gloves? -Do I have rubber gloves? You could do some washing up downstairs, I'm sure, earn £40. -I'll tell you what, I've got a better idea. -Would you like a ride in my car? -I'd love a ride in your car. would I still have to do the washing up? OK, we'll forget the washing up. Forget the washing up and have a ride in my car. but Sarah seems quite happy. -So where are we going? and you even got out of doing those dishes, you old rogue! a chromium-plated cruet and the grafonola. the gnome guarding naturally over Mother Earth. the globe and the Testarossa. Well, amongst James's sea of mediocrity, he bought a tie-press. so although it was £4, it's probably worth 5.
town of Fakenham, and thoughts are turning to the competition. Bingo, are you pleased with your purchases? Cos I was quite amused by some of them, to be perfectly honest. I was delighted with them. I thought, when in Norfolk, what do you think about Norfolk? You think about pheasants, you think about wildlife. OK, mine's stuffed. I will declare my hand. and mine, I'm expecting defeat. Oh, yeah, that's the spirit, Charlie. Today's auction is taking place at the local racecourse. -What time is the first race? -The first race will be 2.30, won't it? -I'll put on a tenner. I stand a better chance with that than my lots, I think. But does auctioneer David James think there's an odds-on favourite? Well, I think the teams have chosen an interesting range of items. but it does look a bit aged, so it might sit well in somebody's garden. and the rest, well, we'll just have to see how it goes. We will indeed. Time for the auction. First up, James's gladioli vase. And I have been given bids to start at £15. 20 in the room. 20, I have. In the room at 20. Five, do I hear? -Are we all sure? At £20, it is. First, second, last time at £20. Next up, Charlie's baker's scales. -My bid starts at £20 only. £30 bid. 40 do I hear? At £30, at 30, £40, I have. £40 I am bid. At 40. Go on, go 50. At 40. At £40, are we done with them? Another profit. So, it's still a close contest. -Very nip and tuck, isn't it? James's tie-press is next to go. Tenner then, come on. Start me at a tenner. Ten, do I hear? Eight, I have. Ten do I hear for the tie-press? At eight I'll sell. £10 on the net, saved by the net. At £10 on the net. Internet bid at 10. A small profit for the tie-press. Up now is the grafonola record player. This is my coup de grace. I have all my eggs in this basket. I'm delighted to say that the bidding starts at £70. Five, do I hear? 70 I have. That puts Charlie in the lead. Wow! Can James's Victorian tazza help him catch up? -I think your tazza's got a bit of money there. Honestly. Not very valuable, but quite collectable. 10, I have. £10 I'm bid. 12 I'll take. £10 I'm bid. £10 I'm bid. £12 on the net. 15 do I hear? -15 bid. 18 do I hear? Are we all done with it? At £15 it is, then. First, second, last time at 15. First loss of the day for James, which puts him further behind. Charlie's tinplate car is next to go. and he's put 20 to 30 on my toy. £12, madam. £12 to the lady. 15 against the bar. £16 to the lady. 18 at the bar. 18 at the bar. -£20 on the net. 22 on the net. 30, do I hear? 25 I'm bid. 28 do I hear? £28 to the lady. Still making a substantial loss, of course. £28. Are we all done at £28? That helps James catch up a bit. Things are a lot tighter now. How will James's gnome fair? I think he's going to be your surprise thumping profit of the day. I'm rather hoping anything north of 30 and I'll be delighted. Who's in at 10? 10 at the back. 10. 12 against the bar. 15 to the lady. -£18 standing at the back. 22 seated to the lady. 25 bid here. £28 to the lady. £30 bid. -There's no accounting for taste, sir, is there? -Or a lack of it. 38. £40. At £40 standing here. All done with it at 40. Well, that's a turn-up for the books and puts James narrowly in the lead. Your in-depth knowledge of antiques is second to none. 10 I have, thank you. £10 bid. 16 on the net. 18 do we hear? 18 on the net. £18 on the net. 20 do we hear? £20 in the room. -No, it's what it cost. -Oh, dear. What's going on? After commission, it's a small loss, I'm afraid. -I'm going down the pan. make you a thumping great profit. Will the paper knife do as well as they think? We'll make a start at £30 to start. 40 do I hear? £40 bid. 50 do I hear? £40 bid. 50 do I hear? At £40, seated in the room. At £45. 50 do I hear? At £45. All done with it? £45. -I'm up against a master here. Just steady work, steady work. That's another good bit of business for James. Charlie's globe now. He had high hopes for this one. So start me off at £30, then. -Oh, dear, is that all? -Start me off at 20. Come on. 15 I'm bid. -£20 standing at the back. 25 standing here. £30 at the back. This needs to be £60. We need a bit more, don't we? -It's coming on, coming on. In the room and standing at £55, are we all done? Another small profit in the old bag. We're down to one item each and it's still all to play for. It's basically all boiling down to a pheasant versus a Ferrari. James's pheasant is last up for him. Start me 10, then, come on. £10 I have. £10 bid. 15 bid. -£20 I'm bid. £20 I'm bid. At the bar, £25 on the net. Coming home to Norfolk, 467. If the Ferrari can come up trumps for Charlie, he will win the day. -Start me at 10, then. It's got to be worth more than that. £10 to start. £10 to start. -£10 to start. Where are we? -Don't they like Ferraris here? 12 do we here? £12 internet bid. £12 only on the net. At £12 only, are we... 15 standing at the back. We take our time in Norfolk. -15 at the back. 18. 16 on the net. £18. Got there. 18 bid in the room. At £18 and selling. Are we done with it at 18? It's a close one, but let's see who's coming out on top. Charlie started this first leg with £200. leaving him with £197.62 to spend next time. James has emerged victorious today. He also started off with £200. meaning he takes £220.10 on to the next leg. Pleasure to be thrashed by you, sir. As always! Where to, sir? ..and James is on electrifying form. I'll be buzzy, I'll be singing arias. Ahhh!